How old does my child need to be to take voice lessons? We believe that a child needs to be 9 years or older to begin to fully grasp vocal technique. 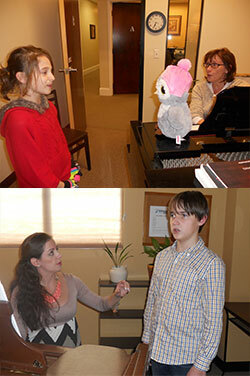 Voice lessons can be taught to children as young as 6 years old, but they will be taught at an age appropriate level. We recommend our Musikgarten classes (provide live link for Musikgarten page) for children under 6 years old. Exposing children to live and recorded music of many styles and the study of an instrument such as the piano should be encouraged along with formal vocal training. Can anyone take voice lessons? Anyone can be trained to sing, from young children to seniors! Learning to match pitch, breathe correctly, and sing properly can save a lot of time correcting bad habits at a later age. Is it necessary to practice between lessons? Yes. The voice is a muscle in the body which requires exercise through daily warm-ups and techniques learned in your lessons. Where can I buy vocal sheet music? Why is the study of voice important? Vocal study can be helpful in many different ways, from building self-confidence not only in singing and performing, but also in public speaking and self-expression!